UPDATE: Here’s the transcript from our #Blogchat discussion on How to Write Like a Thought Leader. 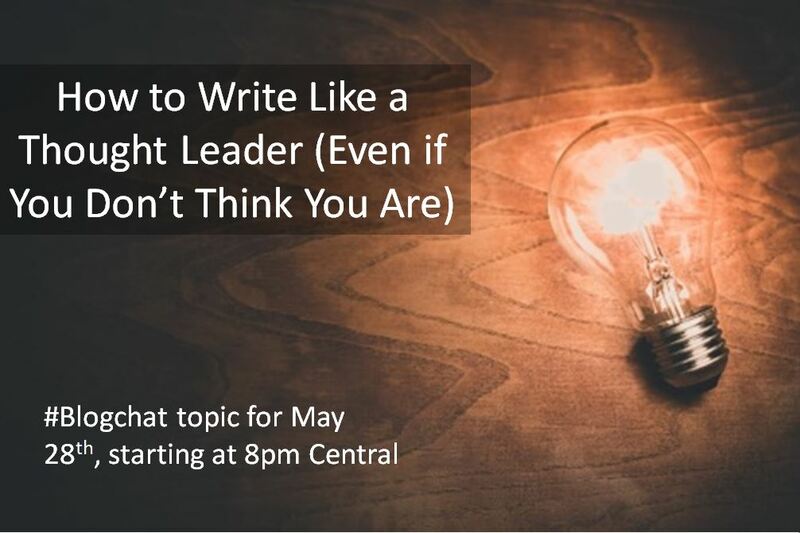 On Sunday (May 28th, 2017), our #Blogchat topic will be How to Write Like a Thought Leader (Even If You Don’t Think You Are). The discussion starts at 8pm Central, and #Blogchat is sponsored in May and June by Marketing Writing Bootcamp. You can save $200 on the 13-class writing course by clicking here. To prepare for this discussion, I’m going to share my thoughts on how to write like a thought leader. First, what does it even mean to be a ‘thought leader’? To me, it means that you spark new ideas and conversations. You share your opinions, but you also offer a new or unique take that makes people view an idea in a new light. 1 – Don’t be afraid to share what you know. We all have expertise around some topic. space or idea. Don’t fall victim to the ‘you can’t self-promote’ blame game. Sharing what you know isn’t self-promotion, it’s helping others. From my experience, the people that claim you can’t self-promote are often the people that are wanting to be better self-promoters themselves. In other words, don’t listen to these people, listen to the people you want to reach and connect with. 3 – Incorporate the ideas of other thought leaders into your content, especially when they agree with your points. Let’s say you are a SME in the automotive manufacturing industry. But the problem is that you aren’t well known and you are blogging to get your name out there and to establish your expertise with an audience that doesn’t yet know who you are. One way to do that is to incorporate the thoughts and ideas from other, more well-known leaders in your space. For example, you could write a blog post that makes a point about a specific topic, then reference quotes from other, more well-known industry leaders, who agree with your stance. 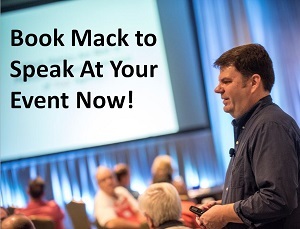 By doing this you are effectively leveraging the credibility of recognized experts in your space to make your ideas look more credible. 4 – If you don’t think you are a thought leader, you won’t write like one. How you view yourself comes across in your writing, whether you realize it or not. If you feel your opinions are valid and worthwhile, you will write in a way that reflects their importance. Don’t feel that you have to convince the reader that your thoughts matter, write as if they do, and the reader will become convinced. Educate yourself, share what you already know, and you’ll be fine. Remember, everyone knows something and you are making your readers smarter and more prepared to face their world by sharing what you know. So those are some ideas to keep in mind and make sure you bring your own this Sunday when our topic will be How to Write Like a Thought Leader (Even If You Don’t Think You Are), starting at 8pm Central. And we’ll also announce who our surprise guest host will be for the #Blogchat on June 4th, you’re going to want to be there for that!